Are you already making gifts for Christmas? If you are, then I'll bet there are some on your list who won't be interested in any jewelry, lovely though it may be. 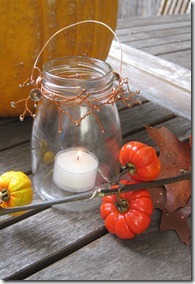 If you happen to like making special treats in jars, then this bead and wire jar holder tutorial might be an excellent way of showing off your jewelry making skills in a different way. The tutorial is by Jenn Mason over at the Cloth, Paper and Scissors site. It's actually conceived as a candle holder as you can see.